Prize Winners - Score Prediction Scores New Car! See some of our Best Contests! Score Prediction Scores New Car! Dallas kicker Dan Bailey’s field goal in the waning moments of the October 19 New York/Dallas contest accomplished more than clinching the win for Dallas. 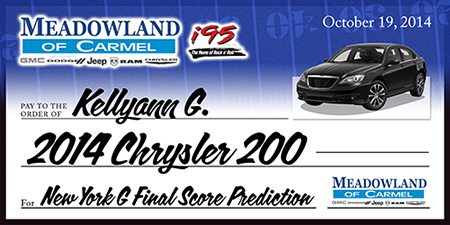 It also clinched a brand new car valued at $30,000 for Kellyann G.
A participant in Townsquare Media’s i95 score prediction contest, Kellyann correctly predicted a final score of 31-21, earning her a new car. Kellyann entered on a custom website for Meadowland of Carmel and i95 provided by Million Dollar Media. Both the dealership and the radio station enjoyed great brand awareness and traffic generated by this contest. Your business can benefit from this sort of turnkey promotion. Contact Million Dollar Media at 732-726-0050 to discuss how. Million Dollar Media is a marketing/promotion company that provides custom marketing/promotion solutions for businesses across North America. Need an idea? We’ve got a Million!